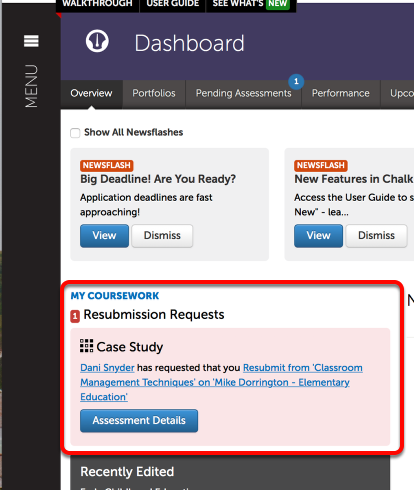 Support DocumentationStudent Resubmission Required: Submit CourseworkWhat is a Resubmission Request? A Resubmission Request occurs when a student has submitted work for assessment and during the assessment process the Assessor decides that they would like to give the student another opportunity to improve their work and resubmit it for assessment again. What Happens when a Resubmission is Requested? You will receive an email from Chalk & Wire to alert you to the resubmission request. Additionally, a message will appear on your Dashboard with a link that will take you directly to the portfolio page that requires resubmission.